Before about 1900, sheet watermarks in papers are often very elaborate. They go well beyond telling you the papermaker's name. Beehives, Eagles, Castles .... So it is not surprising that there are collectors of such watermarks. It's just rather difficult to display the material - you need light boxes. About a dozen years ago I bought the Lindenmeyer collection of Ukraine (the Lindenmeyer who catalogued the Fabergé Zemstvo collection for sale at Corinphila in 1999). In it were many attractive items like the one above. 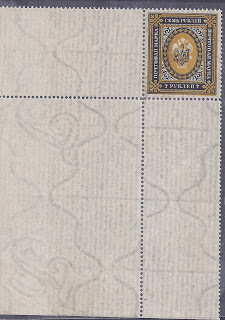 It's a Poltava Type 2 trident on the "old" 7 rouble stamp of Imperial Russia (Bulat # 1030, catalogued $275). It's never hinged mint. But what "makes" this item is the beautiful sheet margin watermark, which only needs black backing paper to make it visible. It is a papermaker's triumph: not only are there the vertical lines which philatelists concern themselves with but the beautiful ornamentation which can only be appreciated when you have marginal stamps like this one. One of my uncles (Jack Burke) worked as a crafstman papermaker in an old paper mill at Eynsford, Kent in England. The paper was made by hand, the craftsman shaking the pulp into sheet format. My uncle told me that sometimes a man would suddenly lose the ability to shake correctly. That was the end of his career. At home, Uncle Jack kept samples of his work, heavy rag papers which were I imagine off the Richter scale in terms of gsm. They had watermarks. When I was a boy in the 1950s, he would sometimes give me a few sheets. I remember them mainly because the edges were so sharp that you could slice your thumb open if you ran it along the edge of the paper.